Many of us resort to a pack of gum to freshen our breath before going out in public – especially if brushing isn’t an option. Some of us use chewing gum because we’ve been told that it can reduce the occurrence of cavities, but is chewing gum really good for you, or, is chewing gum bad for you? Here are four things you should know about chewing gum before you buy that next pack. A study in adolescents who chewed gum and often had headaches produced rather surprising results. All participants chewed gum anywhere from 1 to 6 hours per day. After discontinuing any gum chewing, all headache symptoms completely disappeared in 19 out of the 30 patients, and 7 others experienced some improvement in their symptoms. 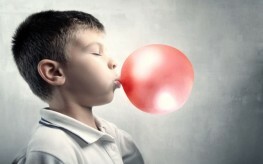 When participants started their gum-chewing habit once more, one third of the children experienced a relapse of headaches within a few days. It is believed that pressure on the temporomandibular joint caused by prolonged chewing caused the headaches. Exposure to ingredients in gum like aspartame may also be involved. This artificial sweetener has been used to replace refined sugar in food, candy, and gum for decades, but most people don’t realize how it is derived. It is carcinogenic, and can cause negative side effects like reducing proper brain functioning and contributing to conditions like fibromyalgia. Many scientists are calling for further study of a genetically modified bacteria which is used to create aspartame, but the evidence is already quite glaring – that the stuff is no good. Look for gum brands that use xylitol instead, which thus far, seems to be a safer alternative (though it may not be effective at preventing dental caries). Is chewing gum bad for you? Let’s look at another issue. If you often have pain in your jaw, neck, shoulders, or a lack of mobility in your jaw when you chew food at meals, it could be due to a gum chewing habit. One of the main causes of TMJ is the overuse of the muscles which allow the jaw to hinge and unhinge. This is why those who grind their teeth at night experience similar negative effects. Try ditching the habit for a few weeks and to if your TMJ is eased. Many people chew gum in order not to indulge in sugary sweets between meals with the hope of losing weight, but a study published in the journal Eating Behaviors found that chewing mint gum prior to eating reduced intake and preference of healthier options like fruit while increasing intake of things like chips and candy. The authors said people who chewed gum experienced ‘a reduction in the consumption of nutrient dense foods’ compared to those who didn’t chew gum for a week. Still really want to chew? Try healthier, natural brands of gum like Pur Gum or Glee Gum, or one that uses xylitol instead. But remember, in the end, it’s important to have a balance between good health and overall life enjoyment. I thought xylitol does help prevent cavities! Aspartame certainly does not..it is a horrible poison and it certainly is not fear mongering to remind folks of that fact. Also may help someone to learn of the gum/headache connection. …As if we dont get enough fear shoved down our throats from “corporate media”.. Most o’ the time NS seems basically hip.. Also, I’ve never noticed any of these horrific, frightening “gum-induced” maladies, & I’ve been chewing gum for a sweet long time.. My gawd, pls stick to TANGIBLE info.., leave the fear mongering to those who “live” for it..!! [ Smiles ] I chewed a lot of gum growing up, so I am not going to miss it. Chewing gum is overrated anyway!